A digital version of LUEGOLU3GO's Nogalious game is accessible on Steam. It runs under a included OpenMSX emulator and is available for download for a price of 3.29 €. Nogalious MSX is a retro action platformer that pays homage to the era of classic 2D platforming on 8-bit personal computers. Explore five different worlds and go through cozy dungeons in the first title of a trilogy that tells the story of Nogalious, his daughter Mariet, and the evil Darama. Steam is a digital distribution platform developed by Valve Corporation for purchasing and playing video games. You need to register. To get an impression a demo version of the game can be played for free on TFH's website. There is also an engaging soundtrack to download with twenty different tunes to add mood and atmosphere to the game, offering a well time of quality music. This soundtrack was make by Gryzor87 (Cursed Castilla, Super Hydorah, Battle Princess Madelyn ...). Related link: WEBMSX Demo version online. Did you try with Steam Play? You can enable it for all titles if needed. The included emulator is a 'limited' version of openMSX. I've succeeeded to launch the game on my Windows system, but the screen remained black. The solution is to go in the console (F10) and to change the video renderer: by default, it's SDLGL-PP and my system seems to accept only the 'classical' SDL (I don't have checked with updating of drivers and don't have the intention to check that). Typing set renderer SDL in the console is the good thing to do! So, where can we find the modifications to the openMSX source code? Or was it used as-is? If they changed openMSX in any way what so ever they need to release the modifications. That's one of the reasons why I placed the project under the GPL. Can anybody who has the steam version confirm that they use an unmodified openMSX version? What is 'limited' is especially the hardcoded (in the main executable) C-Bios MSX1 European machine. Of course, it's still possible to select another machine in the console or the OSD menu, but it will start without the game. A distributable rom is included, it's the demo version of the game. As the main executable is required to play the complete version of the game instead of the demo version, you can't choose to play on a MSX2 machine for example, the only way to get MSX2-like colors is to change the gamma value in the console. And of course if you want to use another emulator (blueMSX for example), you can only play the demo version. So it is permitted to include a GPL licensed runtime with non-GPL binary code (the ROM or disk file) in a commercial release? The boundaries of what is covered by the GPL license terms are kinda vague to me, but if it is allowed then that’s good to know. As long as the non-GPL'ed binary code isn't linked directly then there is no problem. In this case if the main binary simply uses the OS to launch the (unmodified) GPL'ed openMSX binary then there is no problem indeed. They are in that case simply two 'unrelated' processes in your OS. If he would have hardcoded the ROM in the openMSX binary, then he would have to release all the (source! )code that is needed to recreate that altered openMSX binary and that code will have to be GPl'ed also. In this the MSX version of Nogalious would need to be placed under GPL. Put given the fact that apparently he uses openMSX as-is, it seems he is compliant with the GPL. Well, I must precise that the main binary generates the openmsx executable and the roms (c-bios machine and demo). So, it means that emulator and roms are embedded in the main binary. Hello, I'm Rafael from LUEGOLU3GO, I'm who coded both Nogalious MSX and LPGS Steam Launcher, I can confirm you that openMSX is not modified in any way, all the logistic in order to get full version from de demo ROM is made on the LPGS Steam Launcher. LPGS Steam Launcher is in beta phase, and we want to offer to any who want to use in his owns productions in order to easy get his ROMs to Steam community by himself. Of course due to it is in beta phase, it can have bugs an details that must be changed, if you has any problem to launch Nogalious MSX Steam, feel free to contact with me, I'll do all my best to solve your problem. The key question regarding the GPL is whether a ROM packaged together with openMSX is a derived work of openMSX or not. I think that if the ROM and the emulator can be used and upgraded separately, they are separate works, but if the ROM can only be run inside of this package, then the ROM and the emulator together are one work. I haven't checked how the LPGS Steam Launcher works myself, but if the ROM when executed outside of the Steam package only runs in demo mode, then it would seem that the ROM isn't a standalone work. If that is indeed the case, distributing it together with openMSX would not comply with the GPL and therefore be a violation of the copyrights of the openMSX developers, who offered their code for use under the conditions of the GPL. In any case, section 2 of the GPL requires that both copyright notices and the license (GPL) are preserved with all copies of the program. I haven't seen any mention of openMSX being used or the rights that end users have under the GPL on the Steam page for Nogalious MSX. Are they in a different place that I haven't found, or are they missing? If they are missing, please correct that as soon as possible. You can find the copyright notices for openMSX in the file doc/authors.txt and the license in the file doc/GPL.txt. I hope we can together find a way that Nogalious MSX can continue to use openMSX while complying with the GPL. I must say however that the GPL is written to protect end user rights and is therefore fundamentally incompatible with DRM, so if the purpose of the LPGS Steam Launcher is to extend Steam's DRM to MSX games, then it may not be legally possible to use it together with openMSX. @mth: LPGS may control openMSX via remote interface and then change something during execution of ROM to unlock full mode - so the ROM is still standalone work, and if the SHA1 hash of openMSX.exe in the official distribution is the same as the one delivered with Steam game - how can it be modified? @Pencioner: The question isn't whether openMSX is modified, the question is whether openMSX is a part of the game as it is shipped on Steam, or whether the launcher, openMSX and the ROM are independent programs that just happen to be installed together. If you remove openMSX from the game package, the ROM cannot execute anymore. If you bypass the launcher, the ROM loses critical functionality: it reverts to the demo version. So that suggests that the launcher, openMSX and the ROM are not independent programs, since only the three of them put together form the full playable game. Having openMSX embeded in his binary clearly breaks the 'independent and separate works', so Rafael is in violation if he does not make the source code that allows for the complete recreation of the entire binary available under the GPL. A more detailed explanation can be found in the GPL faq. I really hope that an agreement can be reached here. On the one hand I respect the guidelines of the GPL and the OpenMSX community, on the other hand I find it a wonderful idea to buy MSX games from Steam. How often do users ask for digital versions of games and this could be a nice solution for users without real MSX computers. Do something good! In general we love it when people use openMSX, but it has to be done while respecting the license. I believe a solution is possible if LUEGOLU3GO would separate the launcher, openMSX and the ROM. That does mean dropping the DRM, since there is no way to enforce DRM when openMSX and the ROM are fully independent programs. While Steam offers DRM, as far as I know it is up to the individual game developer to enforce it or not. Given that this is an inexpensive indie title, I think most players wouldn't resort to piracy if they can easily buy the game officially. So I'm not sure why the DRM is there in the first place. CBIOS has the BSD license, which allows any modification and distribution (the real libre license imo ). However it does mandate that you include the license terms and copyright notice. It's almost like people take software for granted and think that if something is freely downloadable the license doesn't apply to them or the program itself. We've put a lot of time and effort into openMSX and still do on a daily basis... the least they could do is respect the license and give credit where credit is due. My philosophy - even if someone contributed 1 thing (no matter how small) to a project you give them credit. Taking the whole program without caring about licensing or giving credit just is a big fat F.U. to the face. CLK is licensed under the MIT license. Also MAME is largely (but not entirely) BSD nowadays. Before including a GPL licensed product I would always contact the authors beforehand to avoid misunderstandings and surprises, or else make absolutely sure I fully abide by the license terms. Misunderstanding the GPL license terms is understandable given how complicated it is (the length of that FAQ says as much), but including the license and copyright info is a no-brainer start of course :). What I’m interested in, regardless of DRM or such, is it possible in principle to distribute openMSX and a non-GPL compatible MSX ROM or disk image in one package (not putting the burden on the user to install a separate runtime first), without requiring the MSX software to be licensed under GPL as well? Intuitively a runtime and a binary which it executes are “well separated” (in the words of that FAQ), and bundling it is simply a matter of convenience. However I get a strong feeling it’s far from that simple. A reason why I don’t use GPL myself… It’s never been clear to me what the implications are exactly. Hello again, first of all, I want to tell, that we dont modify openMSX in any way, at the point that the use of openMSX is because, we think its a good open source emulator, but, the process that get full rom from demo rom is entirely done by LPGS Steam Launcher, LPGS Steam Launcher works with openMSX and with any other emulator. And finally, I'm at your entire disposition to explain to OpenMSX team all the technical info they want to know, and of course, as I told before, LPGS Launcher is at the entire disposition to any who want to use in his own projects and they can use with the combination with any emulator they want, not only MSX emulators. rafa32gr the cbios and openMSX license are distribution licenses and not for the end user in this case. If you are not familiar with this I suggest you contact someone who can explain what the legal implications/ramifications are of breaking the license agreement. You are in violation of the GPL license and responsible. Rafael, they way you used/incorporated openMSX is totally unacceptable to the openMSX team. And we would like you to stop using our software in this manner asap. As Maarten already stated we love it when people use openMSX, but it has to be done while fully respecting the license. The GPL states the terms under which we allow this. The GPL is at his heart about protecting the rights of the software user. In short the right to freely run, study, share and modify the software. This means that when distributing our software you agree with these terms and bind yourself to respect these rights. The end-user can not share openMSX in the way you distribute our software since he as no access to openMSX at all in your current software. The way you currently have wrapped openMSX in your launcher means that your launcher should be licensed under the GPL, so that you would give all end-users the same freedoms as stated above (freely run, study, share and modify). Thus also forcing you to offer the code so that we can rebuild the entire launcher including the embeded openMSX and rom since you made it one monolithic block. Have a normal and complete openMSX distribution installed in a subdirectory of the launcher and not embedded in your app. This way people can freely run and share openMSX without having to copy your launcher. And they can replace/modify/update openMSX without having to alter your launcher. Hello turbor and the rest of the OpenMSX team. First of all, thank you for your messages and advice. We have taken instantaneously the necessary measures to cover your demands, without the need to discuss them. Our sole objective in developing LPGS is to offer a new, secure opportunity that allows new 8bits developers to publish their games on Steam and in turn help thousands of people who do not have physical machines to play new games. We have already made the legal text changes that you propose and we have made some small changes to make 100% OpenMSX independent of LPGS (the new version is already on Steam) and that there is not the slightest doubt about compliance with the GPL license, something that we deeply respect and that in no case It will be our intention to infringe. Of course , we want you to check that all ok, please, give me an email and i'll give you Steam codes to check by yourself. I am ready to buy a digital version (.rom) but it can be used on all my MSX devices. I will not buy this STEAM version. @Sebbeug: Buy a cartridge. You can use it on all your MSX. Actually, by including openMSX with its powerful TCL console included, the user is able to extract the 'full version' ROM easily. *edit* I assume it is an oversight/mistake to keep TCL enabled, not a feature =) So don't take it for granted that this option will be available in the future. @hap: While this might be true, this should be only for personal usage. There are other ways to obtain the rom from the launcher (which we will not be discussing), and we would highly recommend that people who would like to play the game on the real hardware go out and buy the actual physical cartridge. Please visit https://www.luegolu3go.com/product-page/nogalious-msx-cartridge for more info. Understand that we as openMSX team do not condone software piracy. Hence we do not even provide rom dumps of bios/basic roms of the MSX machines we emulate. We are working with LUEGOLU3GO in a positive atmosphere of mutual respect as to facilitate them to be able to use openMSX as emulator for their original work (the MSX rom version of Nogalious). Suggesting that they include a modified openMSX would open a whole other can of worms, a situation we all would like to avoid. So allow me to ask you to do the right thing and drop this train of thought please. To be honest, i regulary bought cartridges of MSX Scene. I got a large collection of recent publications. And as lot of people (and sorry for that...) I like to use mass storage device on my physical MSX. Support developpers is important for me, and it's normal. - Digital version = 3,29 euros ---------> Too cheap really. but using Steam (so with internet connection) to play with a .rom game on a limited platform is not a pleasure for me. We are working with LUEGOLU3GO in a positive atmosphere of mutual respect as to facilitate them to be able to use openMSX as emulator for their original work (the MSX rom version of Nogalious). Kudos to all of you! I like this. IT is really a shame to see all the reactions. ok, the guy should have asked in order to include openMSX. BUT, instead of trying to rip all of us, charging for a ROM file, he decided to publish his game at a larger audience where money is not a problem. Specially such small amount. Not to mention that could attract worldwide attention to our community. @to the author: please get in contact with some other emulator authors. Maybe the guy from WebMSX will see no problem with that. DOSBox is another emulator that is GPL licensed. And it's embedded with many games sold on GOG. Isn't that case related to this one? Maybe the lessons learned from them could be applied this situation as well? I believe they must have found a solution for this dilemma. * Does not use or include any kind of DRM nor linking with original code. * Does not hide or camouflage in anyway DosBox program. * The source is available in the DOSBox directory of every DOS game on GOG (1.2 MB as a tar.gz). openMSX is licensed under GPL 2 only. I know is not much but I think you should know that many people here are at side of OpenMSX team and we don´t say enough thank enough for your work, keep going pals! 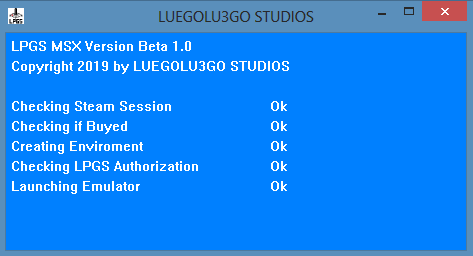 We are very grateful about your emulator and the current license. LUEGOLU3GO has worked with turbo-r to get things corrected. Let's enjoy Nogalious for the great game that it is My inital reaction was sort of harsh but I'm sort of biased when it comes to openMSX. Hm... is the Steam version a full copy? Not exactly, is the usual .rom demo file patched prior execution after checking a couple of DRM processes. In other words, uses a patch file to enable full version patching the demo file temporaly. First of all, thanks to the OpenMSX team for their collaboration and always good disposition. We continue to improve the LPGS services respecting 100% the GPL license following the advice that OpenMSX is transferring us. Since the Beta 4.3 version we have added double security factor beyond the controls that we can apply in the emulator part always respecting the GPL license, avoid in the case of ROM download that this can be used. For us the most important thing is the security of the ROMs, so that when the GPL license of OpenMSX is an inconvenience to be able to cover with guarantees the service that we want to offer (apart from being very grateful for all the collaboration to OpenMSX), we would apply other alternatives to the model in which we have already been working. * Make your own msx1 compact emulator. * Buy a usage license or make an agreement with any author of one of those non GPL emulators out there. Those options are safer for your privative & closed source product if you still want to use Steam. But sincereously, is better making a good product and sell yourself ready to use roms instead of restricting the usage to your legitimate users (as me) and stop making steam store rich with part of your earnings. There are a few developers that sell their products online without any DRM and they have higher earnings and better support from users for it. Also, the costs are very very low compared with 3rd party shops like Steam. Hello, I am Raúl from LUEGOLU3GO. We are working on different alternatives that allow us to create the product that we want, respecting the levels of service and scalability that we are contemplating, in some cases in line with your comments. All of the above, apart from being very grateful to OpenMSX and its team for the good disposition and collaboration they have always had with LUEGOLU3GO STUDIOS. As we see is Steam like another channel, a channel that allows us to reach MSX games with players from all over the world who, in many cases, did not know about the MSX system, did not know certain types of games and could find them interesting. We are working on being able to reach other channels besides having their own. Our main objective is to reach the whole world and do it with a model that allows us to play MSX games taking advantage of current technology and current distribution channels, giving value to developers and offering millions of players something totally new to them, helping to keep MSX system and other retro systems alive. That could be done all perfectly fine with openMSX and without a DRM system.... Right? This can be done perfectly with OpenMSX and with a DRM system, in fact we are doing it. The LPGS suite is made up of different products, all of them aimed at reaching millions of people around the world and for each product we are working with the best alternatives. For example, for other products in the suite where we need absolute control of the emulator, we have acquired fMSX. The only game I bought with DRM from STEAM have not been usable after system update. Finally I had to find a hack to play with it. The game starts really faster since and still works now. So I have the same opinion as Sebbeug. I can not buy all the games I want in cartridge. It's very simple ... if we want to promote and help new games on MSX, more and more, and that the developers are encouraged to do them, it has to be secure and avoiding that the ROMs are moving for free (except that the developer wants). To promote new MSX games always will be better a full open source/open hardware solution. Advice speak with Mr Nishi/Msx Licensing Corporation to know about the legal status of what you are tryng to do.